John Schlimm is a Harvard-trained educator, artist, and award-winning writer. He has traveled the country speaking about inspirational/motivational topics, cooking, entertaining, and public relations, including his "Embrace Compassion, Change the World" keynote address on Capitol Hill. He has appeared on such national media outlets as The Ellen DeGeneres Show, Bravo’s Watch What Happens Live, NPR, Martha Stewart Living's Everyday Food, The Splendid Table, QVC, and Fox & Friends. John also recently debuted his participatory art piece THE SMILE THAT CHANGED THE WORLD (is yours) with installations in Canada and Washington, D.C.
"Empowering and heartfelt, Five Years in Heaven is a beautiful testament to new beginnings and second chances at any age." "What can an 87-year-old Benedictine sister teach a world-weary 31-year-old self-described ‘lost and disoriented’ man? More than he could have imagined. What can this book about their unique relationship teach you? More than you can imagine. This heartwarming story about spiritual friendship shows how God's love can be revealed in the most surprising of ways, and people." 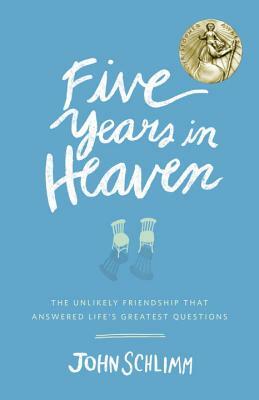 "Five Years in Heaven is a beautiful tribute to the divine wisdom and comfort of friendship. This is an inspiring blueprint for living life to the fullest at any age."